If you’ve been to the Magic Kingdom at Disney World in Florida recently, you’ve seen that the Fantasyland area is under heavy construction — that’s because the area is currently undergoing a major expansion that will nearly double the size of the original Fantasyland. One of the main objectives of the expansion is to add a whole bunch of new Beauty and the Beast-themed attractions, eateries, and architecture, including Beast’s Castle! Check out the image here below, via Disney Parks Blog, that provides a sneak peek of Beast’s Castle, which will house the Be Our Guest restaurant, scheduled to open in late 2012. The restaurant is said to “offer a lavish dining experience in the castle’s elegant ballroom, gallery and mysterious “west-wing.” Eventually, other Beauty and the Beast-themed buildings will open around the Castle, like Gaston’s Tavern, Bonjour! Village Gifts, and the cottage of Belle’s father, Maurice. And of course, there will be a meet-and-greet with Belle and her friends. Along with the Beauty and the Beast additions, the expansion will also include new attractions for Snow White and the Seven Dwarfs, The Little Mermaid, and Dumbo, as well as Princess Fairytale Hall, the new home for Disney Princesses like Aurora, Cinderella, Tiana, Rapunzel, and more. 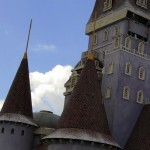 The new Fantasyland is scheduled to be completed some time in 2013. Mouse Steps caught some video of the construction of Beast’s Castle, which you can view here below. Beauty and the Beast is one of my favorite Disney movies (as evidenced by the many themed snowglobes I own), so I, for one, am super-excited for the new Fantasyland and all it has in store for visitors to the theme park.